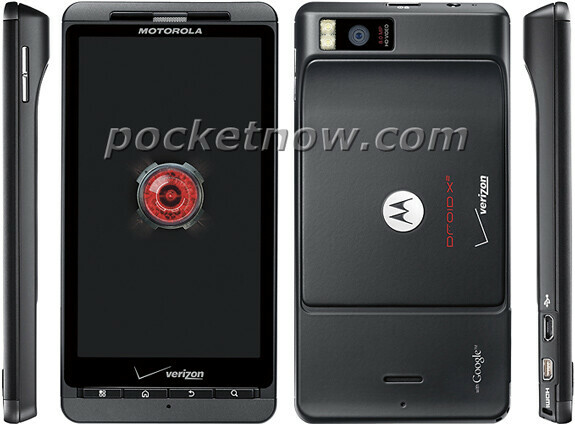 New press pictures have been released for the sequel to the Motorola DROID X. 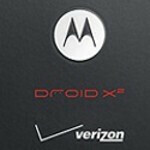 Originally expected to be named the DROID X2, the pictures show that the actual title is the Motorola DROID X^2 (X-squared). Even better than that new name is the 1.2GHz dual-core processor expected under the hood, a nice bump from the 1GHz chipset on the original model. The screen stays the same 4.3 inches, but resolution is now improved to qHD and a boost in RAM to 768MB is possible. After the removal of the physical camera button, the rest of the DROID X-squared specs appear to be the same as those on the device that was Verizon's flagship model until the recent launch of the HTC ThunderBolt. And unfortunately, that means no LTE connectivity for the unit. Still unknown at this point is which build of Android will be on board. Hopefully, we will see Gingerbread installed on the Motorola DROID X^2 by the time the device gets launched-which is also unknown at this time. Whats the cosmetic differences between this and Droid X? The lack of a dedicated camera button on the side. no physical camera like the previous 1. The original X had a camera button buddy. And it had a camera... What drugz this guy on? There are none. This is the exact same phone with a few tweeks internally. good catch Alex. Missed the missing camera button. i have the atrix right now and its a great phone, but having a bootloader leaves me feeling locked off and at the mercy of my carrier. This is the last time i buy a motorola. they should have added a front facing camera as well. i realize that it's a 3G phone and all but HTC did do it with the Incredible 2. I agree. The iPhone 4 is 3G only and apps like Tango and Skype work well. 4G isn't needed for video calls. And yes, I'm talking about the Verizon model. Verizon's network is slightly slower than AT&T's but the video calls still work good. Actually I noticed that during peak times the AT&T iPhone had trouble with video calls. Verizon's seems to work better with the consistant speeds. that's true, i hadn't even thought of the iPhone 4. it's a good example. I understand that not everyone has LTE coverage or want to pay extra for LTE but Come on! A phone this great deserves it. 2 major flaws. 1. Its made by Motorola. 2. Its a droid. If the X2 comes with Gingerbread and the new version of Blur, you all might as well stop your crying right now. Somebody is full of fail for coming in and downthumbing everyone. I have the Droid X and it is overall a good phone... I was going to hold out for the Bionic, which is the X2 (same thing I think). However, Verizon is supposed to switch to tiered pricing. I am wondering if I should get the HTC 4G phone out now to get grandfathered nto unlimited 4G ?? I also heard the Bionic has been delayed to Q3 via wall street article... My guess is that Verizone will probably go to tiered pricing on the exact release day of the DROID X2, it makes too much sense, does it not?? Maybe I should just get the HTC and get grandfathered?? By the time the X2 comes out, the tiered 4G will be here I think. ?? That all plastic contruction and design looks ugly. This is probably similar to the change that Apple is going to make with the Iphone 5. A bump in internal specs but with almost the same body. Is this one supposed to be locked or unlocked? i know the original one was locked.